Raincheck gets a 5 star review and The Blog Hop continues! I woke up this morning to discover a wonderful 5 star review for my paranormal M/M novella, Raincheck, on the Paranormal Romance Guild! I have to confess, I’ve been thinking more and more about expanding Raincheck–everyone wants to know what happened the morning after the Grand Ball, right? Rodney and David have more of their story left to tell! In the meantime, there is The Romance Review Fall into Romance Blog Hop going on right now! The list of participating authors is unbelievable! You should check out the contests and prize giveaways going on now through Sept 21st. I have a Q&A giveaway question there: the answer is a World War 2 listening post. Want to know the question and find out how you can win some terrific stories and other great prizes? Check out the hop! This entry was posted in Uncategorized and tagged blog hop, contests, raincheck, reviews, Sarah Madison by Sarah Madison. Bookmark the permalink. Aww, sweetie. 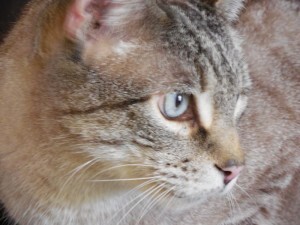 He looks like my sister’s cat Tigger, who lets no Q-Tip go unpunished! Same age, also. Never stop playing. 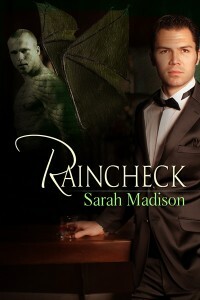 Sarah Madison recently posted..Raincheck gets a 5 star review and The Blog Hop continues!